Comments: Byron Wright Chapin (Nee: ) | Ely MN United States | 1941-1960 | Comments: Byron Wright Chapin,1910-1981. Son of Chester John Sylvester Chapin & Emma Jean Baker. Sisters Margaret Elizabeth CHAPIN Whitnal, Winnifred Emma Jean CHAPIN Rinehart Tubbs, Evelyn Adda CHAPIN Jones, Isabel Emma CHAPIN Bruegger Estabrooks Lee. Brothers James Bartlett Chapin, Donald George Chapin, Stanley Chester Chapin, Forest Lloyd. Byron m. Vivian Kaufman Davies, daughter Sheila Rae. m. Betty Ernestine Wehrli, 3 daughters Lynn Darlene, Kristine Anne, Cynthia Kay. m. Virginia Hannah, no children. 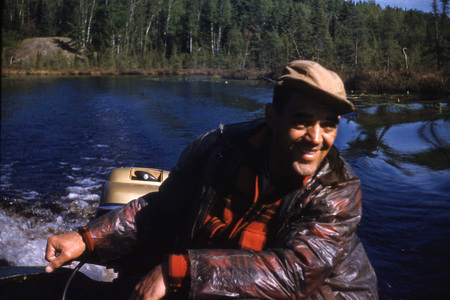 Photo taken of Byron doing his favorite thing, by Betty Chapin before 1964. My original is a 33mm slide. Glad to exchange information.